It's been 14 years since the first Ratchet and Clank game was released by Insomniac Games for PlayStation 2. I don't say this to make you shake your head in disbelief at how much time has passed; I say it to point out how incredible it is that the franchise has thrived for so long. Eight main titles and five spin-offs have been released since that first game, and although, for me, none since have held the magic of the first, they've been consistently good. However, you can only go on for so long before consistent won't cut it anymore. You need to shake things up, but not at the expense of distancing existing fans. There's no better way of drawing back your old fans than giving them the opportunity to tell newcomers that they've been there from the beginning. Ladies and gentlemen, you know what that means: a reboot and a movie tie-in. Yes, Ratchet and Clank for Playstation 4 is a game based on a movie that's based on the original 2002 game. But it's a re-imagining of the game rather than a remastering, so for all you fans who think you've been there and done that, fear not - there are plenty of reasons to visit again. For anyone familiar with the series many of the environments, characters, weapons and gameplay elements are immediately recognisable. Fortunately, they're as fun here as they were in the original game, as well as being elements you'd expect any good platformer to have. It remains incredibly satisfying to wield Ratchet's Omniwrench 8000, smashing enemies and crates with equal brutality and watching the all-important currency of nuts and bolts fly towards you like you're some kind of fur-coated magnet. "Most importantly, Ratchet and Clank manages to hold onto its sense of humor"
The weapons are as creative as they ever were and the combat system is straightforward and well explained. Environmental puzzles also make a return, and are fun without ever being overly challenging, giving players the chance to control Clank in moments that require more brains than brawn. They also provide a nice break from fighting hoards of enemies. The most important thing that this reboot manages to hold onto is its sense of humor and likeable characters. Ratchet and Clank has a tongue-in-cheek self-awareness that will appeal to players young and old, and its characters are a pleasure to play as and alongside. This isn't only thanks to great writing, but also an excellent voice cast who make the character personalities shine through the pixels. Captain Qwark's extremely one-sided narration is a notable highlight of the game. Another thing that stops this reboot from feeling stale is that, as well as re-imagining the main storyline of the original game, Insomniac has re-imagined the environments of several planets such as Veldin, Aridia, Kerwan, Rilgar, and Novalis, so that they're recognisable but different enough to impress you all over again. Kind of like visiting a different part of a sprawling city. But Ratchet and Clank has a solid amount of completely fresh content to offer, too. The most obvious thing that helps it feel new is how it looks. The Ratchet and Clank games have always been pretty, but this instalment can make it sometimes feel like you're playing the animated movie. This feeling is reinforced by the game's almost seamless integration of several film-quality cutscenes, as well as silky smooth frame rate. As well as the re-imagined planets from the original game, Ratchet and Clank has entirely new planets for you to explore. Designing creative and diverse environments that feel alive is something R&C can boast about; no two planets feel the same, with each having its own distinct atmosphere and terrain. "For sheer creativity I think my favorite new weapon has to be The Pixeliser"
The levels on each of these planets generally have a pathway that you follow to progress, but now and again levels unexpectedly open up. The variety of things you do in each location, whether it's using your jetpack to fly over lava pits, swimming through water-logged sewers, or flying your spaceship into a dogfight, stops the tight platforming structure from feeling restrictive. Overall, it will probably take you somewhere between 12 and 14 hours to play through the game in its entirety. There's no major reason to revisit levels (other than for fun) and if you're thorough in your first playthrough it's highly likely that you'll have purchased all of the available weapons, considering how easy it is to rack up the game's currency. What might convince completionists to return to levels is collecting all of the rare golden bolts which enable you to unlock in-game cheats like infinite ammo and invincibility. The Ratchet and Clank franchise has one of the most creative weapon arsenals in video games, and while this game keeps some of the old favorites (you have no idea how relieved I was to see the Groovitron) drawing them from not only the first game but others later in the series, it was nice to see that the developers hadn't exhausted their imaginations. When it comes to power and usefulness I love the Proton Drum, but for sheer creativity I think my favorite new weapon has to be The Pixeliser. I won't spoil what it does, though the name is a bit of a giveaway. As well as the weapons themselves, the game adds some new ways to use them with a useful d-pad selection system and a Raritanium-based upgrade system that enables you to increase things like a weapon's power, range, and ammo. The game's mechanics and controls both in and outside of combat don't break any new ground but they're solid and reliable. Just like Clank. One thing I wish had been added is a multiplayer mode, especially a local multiplayer. Although this was a successful feature in other titles in the franchise, I'm disappointed by its absence this time around. The addition of new Galactic Rangers could have made for some really fun multiplayer opportunities but I expect that, considering its movie tie-in, greater focus had to be put on establishing a strong main story. If you would like some sort of local multiplayer element the only thing I can suggest is to visit the planet Rilgar and take turns with a friend to beat the other's score in the hoverboard races. I promise you, it can get very competitive very quickly. Don't be put off by the fact that Ratchet and Clank is being launched alongside a film; it's an excellent, polished, and charismatic game in its own right. 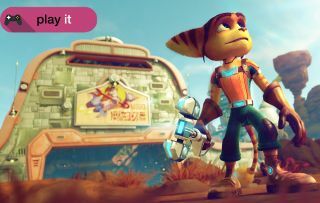 Whether you're a fan of the series already or you've never encountered a Lombax in your life, Ratchet and Clank strikes the balance between familiar and new content just enough to work both as an introduction and a re-introduction. The game doesn't do anything astoundingly new in its genre but if you want a fun, visually impressive and solid platforming experience, you want Ratchet and Clank.